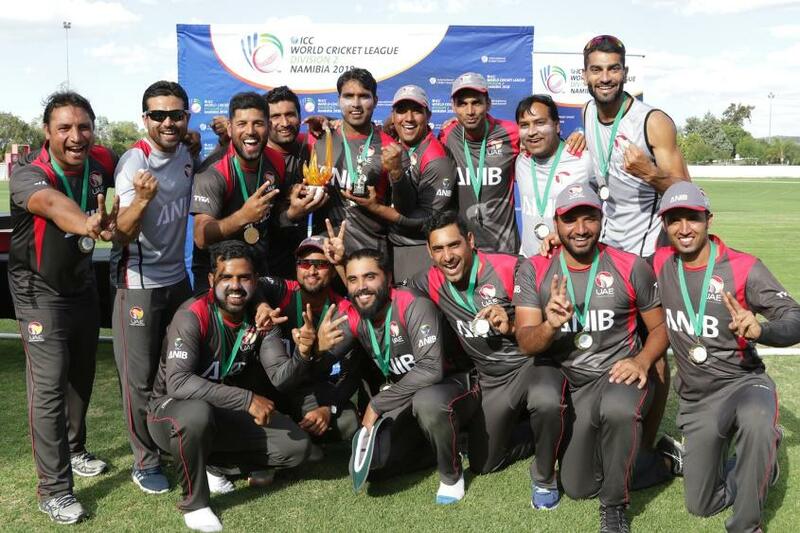 UAE crowned ICC World Cricket League Division 2 champions and will join the Windies, Ireland, the Netherlands and PNG in group A of the ICC Cricket World Cup Qualifier. The United Arab Emirates have been crowned the ICC World Cricket League Division 2 champions in Windhoek after beating Nepal by seven runs. The UAE will now join the Windies, Ireland, the Netherlands and PNG in Group A at the ICC Cricket World Cup Qualifier in Zimbabwe, whilst Nepal will take the remaining spot in group B alongside Afghanistan, Hong Kong, Scotland and Zimbabwe. Canada secured third place in Division 2 beating Namibia by 49 runs, who took fourth, while Oman finished fifth after a five-wicket win over sixth-placed Kenya. The UAE won the ICC World Cricket League Division 2 by defeating Nepal by seven runs in an exciting end to a thrilling tournament in Windhoek. After the celebrations of yesterday’s matches it was back to business today. The UAE batting order all played their part, but Ashfaq Ahmed’s century (114, 123b, 10x4, 3x6) was the stand-out batting performance. Captain Rohan Mustafa (51), Rameez Shahzad (41 not out) and Shaiman Anwar (40) all chipped in with important runs. Sandeep Lamichhane (1-39) was once again the stand-out bowler for Nepal. The UAE finished their innings on 270 for eight after their 50 overs. In reply, Nepal had their own century-maker, captain Paras Khadka (112*, 103b, 3x4, 8x6), who almost led Nepal over the line again in another close match. His heroics earned him the title of most runs in the tournament at 241, and although he was supported by Dipendra Airee (35) and Sharad Vesawkar (30), their runs were not quite enough as they fell eight runs short of victory. The UAE’s Amir Hayat was the stand-out bowler with four for 53. Nepal’s Lamichhane was awarded the Player of the Tournament for his 17 wickets for 176 runs in the campaign. Canada secured third place by defeating Namibia by 49 runs at WAP. Canada, batting first, can thank the 140-run partnership – the highest of the tournament – by Nicholas Kirton (73, 111b, 4x4, 1x6) and Navneet Dhaliwal (78, 84b, 4x4, 2x6) for getting to 247 for four in 50 overs. Nitish Kumar (33), Srimantha Wijeratne (28) and Hamza Tariq (23) all chipped in with important runs. Namibia’s Petrus Burger took two wickets for 28 runs and was the pick of the bowlers. 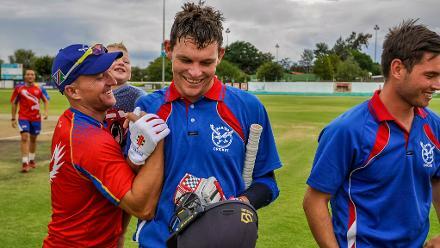 Namibia’s batters all got starts with only LP van der Westhuizen (53, 54b, 5x4, 2x6) going on to get a half-century. Gerhard Erasmus (42) and Stephan Baard (29) was not enough to chase down Canada’s target. Canada’s Saad Bin Zafar took three wickets for 40 runs as the North American side secured third place with a 49-run victory. Kenya, who had lost every match in the tournament before today, batted first and posted 253 runs in 49.5 overs. Dhiren Gondaria (68, 49b, 3x4, 5x6) and Shem Ngoche (66, 68b, 5x4, 3x6) helped to restore a bit of confidence in the African team. Nelson Odhiambo also contributed 42 runs, but it was Oman’s Bilal Khan who provided the standout bowling performance with five for 40, which helped Oman secure fifth place. Oman’s reply centered on one batter, Khawar Ali, who hit 112 (142b, 11x4) not out to lead Oman to victory by five wickets. VS Wategaonkar (67) and Zeeshan Maqsood (33) chipped in runs, while Dhiren Gondaria was the pick of the Kenya bowlers with two wickets for 17 runs. It wasn’t enough for Kenya, who completed a miserable week without a win under their belt.